Kevin O’Brien, SJ, explains that the Third Week of the Spiritual Exercises is an extended meditation on the passion, suffering, and death of Jesus Christ. This week can be difficult, because we are accompanying our friend Jesus Christ whom we have gotten to know throughout the Exercises, through our days of prayer. We are accompanying our Lord in suffering and in death. But we are not to inflict amnesia on ourselves, because we know as Christians that the shadows of Good Friday will yield to the dawn of Easter morning. And so the suffering and death of Jesus must always be remembered and lived in context of the hope that springs eternal, the hope of Easter morning. 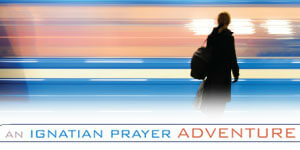 This video is part of An Ignatian Prayer Adventure, Week 7. Because of the meditation on the Passion and rejection of Jesus and his living through it to the resurrection, I have been able to accept the many rejection of my immediate family with dignity and grace. Walking close to Jesus and turning over everything, even the smallest issues daily is a safety net to prevent unholy responses that would further hurt and break up the family. Christlike behavior soothes and heals. Christlike compassion is mighty. Father, you are so right about how hard it is to accompany Jesus after these two and a half weeks of the Spiritual Exercises. It seems just too hard. But we have to “let ourselves be schooled in what Love looks like.” In these days of violent persecution of Christians worldwide it’s important to remember, and to hold this memory for what may lie ahead for any one of us, that death and suffering and violence will not have the last word, but God will. Thank you for this moving reflection. I appreciate the message that at the end of the Passion and Death of Christ there is Resurrection, that hope is at the end of it all, that we have a very great chance of spending eternity with Christ, His Father and the Holy Spirit. I have to learn how to carry my own cross to my end which is forgiveness of my sins, and then my hope will be rewarded with my own Resurrection in the Trinity. I keep being reminded how the sun is always shining, no matter night, bad weather, horrific upheaval. Hope is there. The Resurrection is there. Jesus is there. And I can be there. My gratitude is boundless. “We do not run from the Lord in His suffering but be with Him with great compassion.” Thank you so very much for this incredibly powerful message.